Google's Proposed ITA Deal Has The Online Travel Industry Crying, "No Fair!" Google’s proposed $700 million acquisition of flight data powerhouse ITA Software is running into some serious resistance from the online travel industry. A group of online travel companies including Expedia, Kayak, Travelocity, and TripAdvisor are lobbying the Justice Department to block the deal on antitrust grounds through an organization called FairSearch. Some of these companies were also behind competing bids for ITA Software which failed. Microsoft separately opposes the deal as well. ITA provides flight data, schedules, fares, and availability to many of these travel sites, airline sites and Microsoft’s Bing search engine. 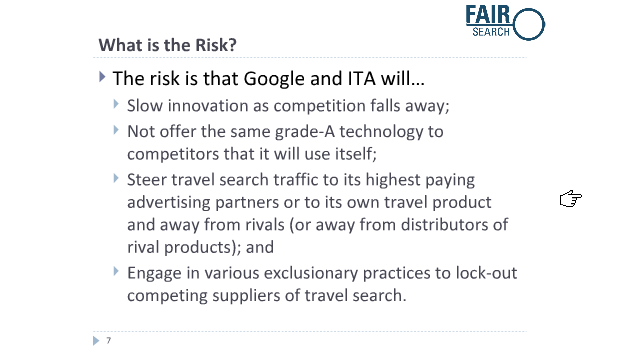 The FairSearch coalition argues that allowing “Google could use ITA to try to marginalize competitors in ways that raise prices for consumers and limit innovation.” They fear that Google will use its search dominance to steer traffic away from their own sites and favor flight search on Google itself. These fears are not completely unfounded. A lot is at stake here. Online travel is a huge business. It accounts for an estimated $80 billion in ecommerce sales, or 38 percent of all ecommerce last year (the biggest segment by far). It also contributed an estimated 6 percent of online advertising (and an estimated 8 to 10 percent of Google’s revenues). About two thirds of all travel plans start on a search engine, and FairSearch claims that more than 30 percent of all travel searches already start on Google. Getting this deal through the Justice Department will be a big test for Google. For its part, Google responds that it will honor all of ITA’s existing contracts, won’t sell airline tickets, and it plans to keep sending traffic to travel and airline sites. 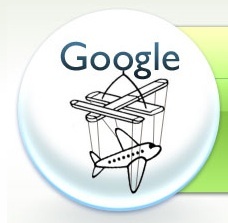 The reason Google wants ITA is because flight search is broken and needs fixing. But in order to fix flight search, Google will very likely try to keep people on Google longer before sending them off to a travel site. Just like the ITA-powered travel section of Bing today is a fully-functioning travel search engine until the last click to purchase, Google will likely move in a similar direction. The travel sites understandably don’t like the prospect of Google gaining even more control over their business. As I’ve written before, the ITA deal represents a huge shift in strategy for Google towards more vertical search and a possble move from cost-per-click (CPC) to cost-per-action (CPA) advertising. What if Google starts charging travel sites a CPA bounty based on each ticket purchased instead of just for every click it sends? Google would make more money under such a scenario, and the travel sites would make less—but only if Google has good enough data to know which flights to show which travel seekers. That is why Google needs to own ITA and all of its data. Does that raise antitrust concerns? Maybe. But it’s all hypothetical harm at this point. Only one thing is certain If Google gets this deal past the DOJ, you can expect a few more going after other online industry verticals, which in turn will change the Google search experience depending on the type of search you do.